It has been some time now that I am more and more interested in artistic influences between the Eastern and Western Mediterranean. As always, nothing new under the sun: I am not the first one. Anna Contadini, in her beautiful article ‘Sharing a Taste? Material Culture and Intellectual Curiosity around the Mediterranean, from the Eleventh to the Sixteenth Century’, provides a long survey on ‘Islamic’ objects and influences throughout Europe. As an Italian, I have always been interested in the artistic influences from the Islamic world that can be found in Italian masterpieces. And as I am particularly interested in inscriptions, I am even more keen to know the use of Arabic, or better pseudo-Arabic inscriptions, in Italian art. As usually, ideas and arts travel with goods. When the Italian city states and the maritime republics became increasingly important, Middle Eastern artefacts began to reach Italy not only through Sicily and the Southern regions, “but also through the commercial activities of Genoa, Pisa, Lucca, Siena, Florence, Amalfi” (p. 37) and Venice. Also, with the rise of the Ottoman Empire, particularly after 1453 and the Ottoman power in Constantinople, the commercial relations between Italy and Turkey developed more and more. What did they trade? Among other, luxury goods: carpets and textiles. The rugs market and their trade between the Middle East/North Africa and Europe (especially Italy) are well attested starting from the 14th century. The rugs were imported in particular by Florence and Venice. Sources confirms that noble Italian families commissioned rugs requiring also the inclusion of their coats of arms. Also middle class used Middle Eastern rugs, usually of smaller size. The rugs were luxury goods: they were not intended to be walked on! They were used to cover furnitures mainly. They were considered to be such a luxury, that painters included them in portraits, to underline wealth, and also in sacred paintings, to demarcate the holy space. 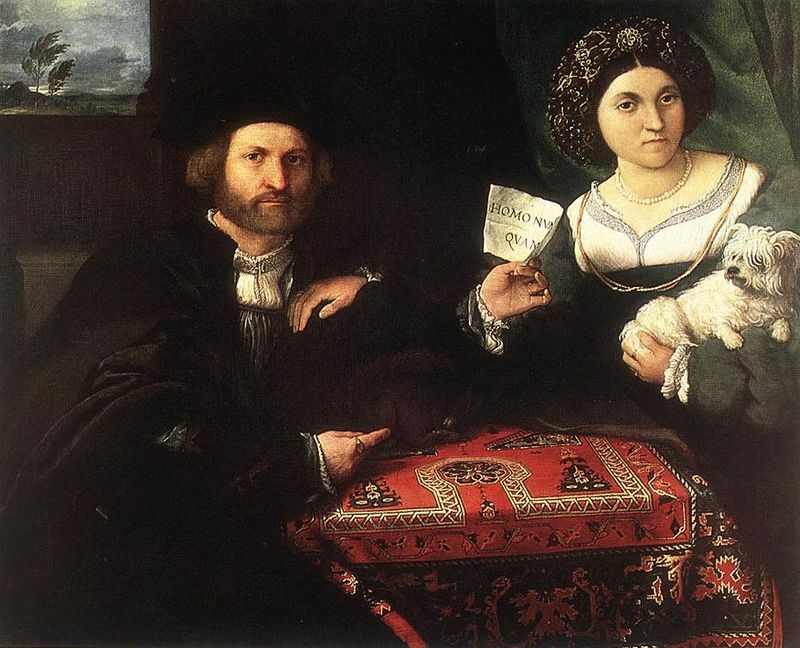 But not only rugs appear in Italian Renaissance paintings. Textiles were also extensively imported from the Middle East. The textiles such as silk or velvet were seen as luxury commodities and evidences point out how they were predominantly used by upper classes. Together with textiles other luxury goods were imported, such as metalwork. Thus, also inscribed objects were known in Renaissance Italy, and again we find a proof for it in Italian paintings from the period. In more than a case we discover that the painters used Arabic script, or better, pseudo-Arabic script with decorative purposes. 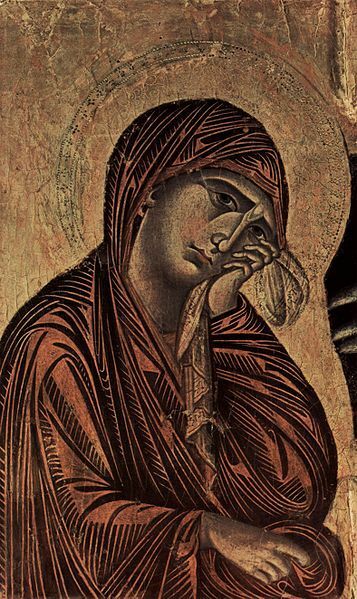 The first example we have comes as early as the 13th century: in Cimabue Crucifix (1265-1268) , the crying Virgin Mary holds a mandil (a fine handkerchief) with an epigraphic band in Pseudo-Arabic. 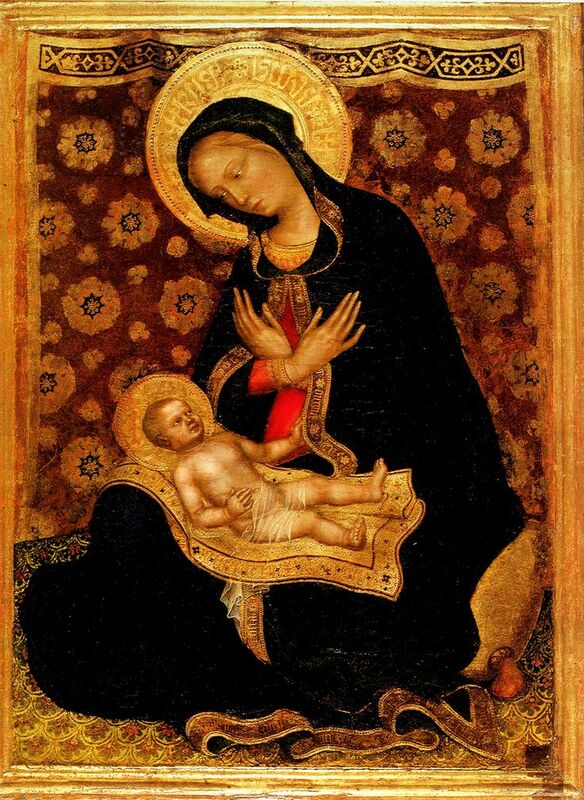 But, with no doubts, we must say that the one that exploited most the decorative possibilities of pseudo-Arabic inscriptions was Gentile da Fabriano (1370-1427). 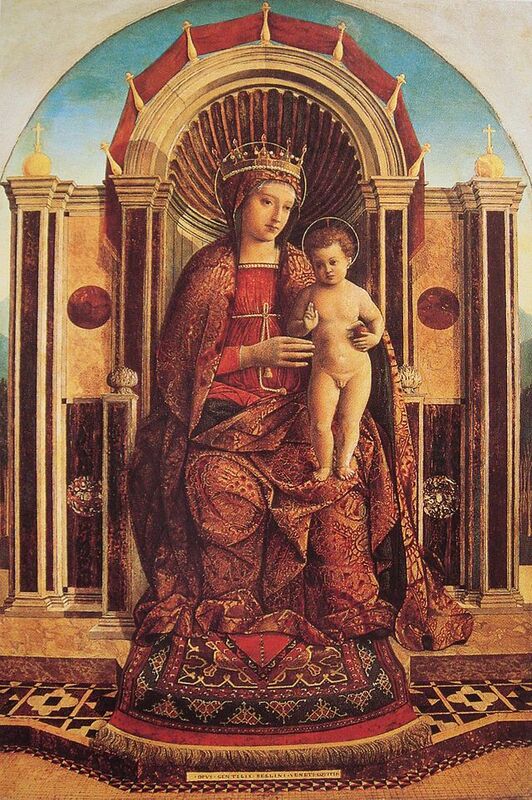 In his Madonna of Humility he uses pseudo-Arabic to decorate the halo of the Virgin Mary. 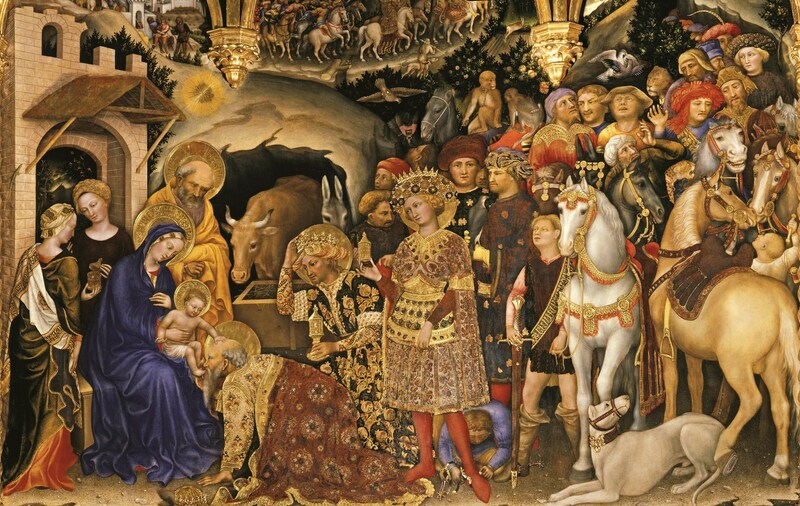 And nearly one decade later the painter uses again pseudo-Arabic inscriptions in his masterpiece, The Adoration of the Magi. Here the painting is full of Oriental references: turbaned men, pseudo-Arabic inscriptions in the haloes of the Virgin Mary and Saint Joseph and on the clothing. 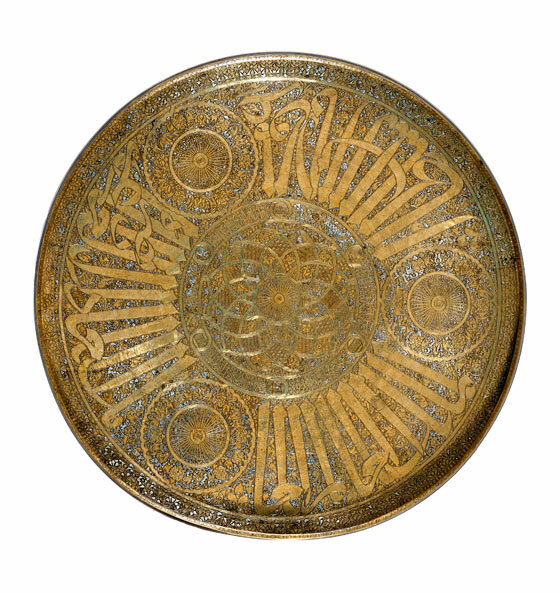 It is interesting to note that the source for these ‘inscriptions’ were not the tiraz bands or textiles, but metalwork, most probably Mamluk metal wares.